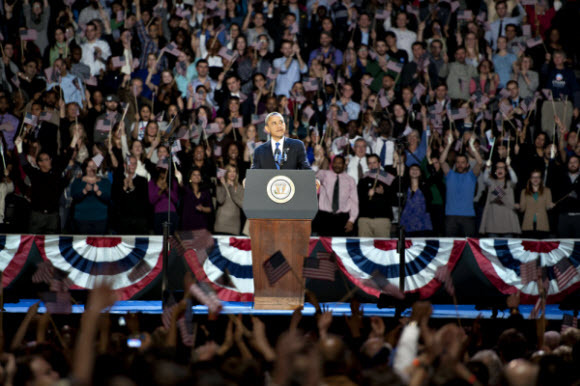 Barack Obama retained enough support from key elements of his base to win reelection, even as he lost ground nationally since 2008. In particular, Obama maintained wide advantages among young people, women, minorities, and both the less affluent and the well-educated. Overall, Obama benefited from relatively strong turnout – both nationally and in key battleground states – among young people and minorities. Obama won voters younger than 30 by a somewhat smaller margin than he did four years ago, but these voters made up about as large a share of the electorate as they did in 2008, according to national exit polls conducted by the National Election Pool. Moreover, African Americans, Latinos and Asian Americans backed Obama by huge margins. Read more on our Campaign 2012 page. Latinos voted for President Barack Obama and Vice President Joe Biden over Republicans Mitt Romney and Paul Ryan by a margin of more than two-to-one in the 2012 presidential election, 71% versus 27%, according to an analysis of exit polls by the Pew Hispanic Center, a Project of the Pew Research Center. 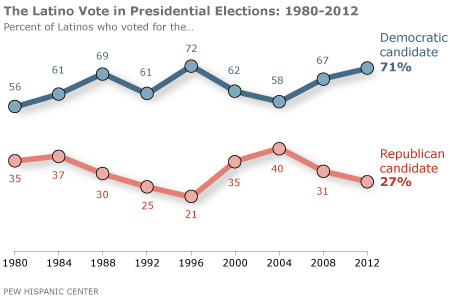 Obama’s national vote share among Hispanic voters is the highest seen by a Democratic candidate since 1996. In this year’s campaign, the Hispanic vote was an important building block for Obama’s win in several key states. In Colorado, Obama carried the Latino vote by a wide margin-75% to 23%. In Nevada, Obama won the Hispanic vote 70% versus 25%. In both states the Hispanic share of voters increased. In Colorado, 14% of voters were Hispanic, up from 13% in 2008. In Nevada, the Hispanic share was 18%, up from 15% in 2008. In the case of Florida, the state’s growing non-Cuban population-especially growth in the Puerto Rican population in central Florida-helped contribute to the President’s greater advantage among Hispanic voters this year over 2008. According to the Florida state exit poll, 60% of Hispanic voters supported Obama while 39% voted for Romney. The minority groups that carried President Obama to victory yesterday by giving him 80% of their votes are on track to become a majority of the nation’s population by 2050, according to projections by the Pew Research Center. They currently make up 37% of the population, and they cast a record 28% of the votes in the 2012 presidential election, according to the election exit polls.By 2050, the Hispanic share of the U.S. population could be as high as 29%, up from 17% now. The black proportion of the population is projected to be unchanged at 13%, while the Asian share is projected to increase to 9% from its current 5%. 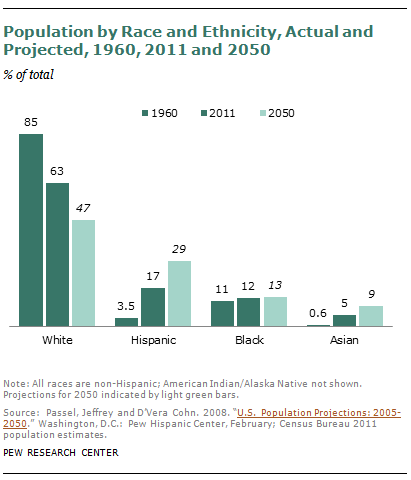 Non-Hispanic whites, 63% of the current population, will decrease to half or slightly less than half of the population by 2050. The forces behind this transformation are a mix of immigration, births and deaths. The United States is more than four decades into what has been, in absolute numbers, the biggest immigration wave in its history-more than 40 million arrivals. Unlike previous waves that were almost entirely from Europe, the modern influx has been dominated by Hispanic and Asian immigrants. In his re-election victory, Democrat Barack Obama narrowly defeated Republican Mitt Romney in the national popular vote (50% to 48%). Obama’s margin of victory was much smaller than in 2008 when he defeated John McCain by a 53% to 46% margin, and he lost ground among white evangelical Protestants and white Catholics. 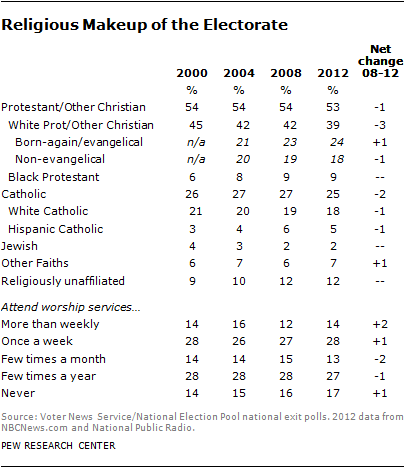 But the basic religious contours of the 2012 electorate resemble recent elections – traditionally Republican groups such as white evangelicals and weekly churchgoers strongly backed Romney, while traditionally Democratic groups such as black Protestants, Hispanic Catholics, Jews and the religiously unaffiliated backed Obama by large margins.